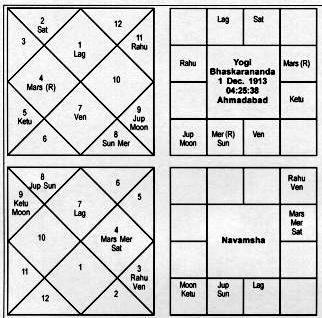 Dr. B.V. Raman had given him (my Jyotish Guru) a span of life of 90 years according to his astrological calculation perhaps because his Atmakaraka, Moon, was in the 9th house with Jupiter. But he himself had said, "I will take samadhi as soon as the mahadasha of Mercury will begin." 1. The lagna and the 8th lord, Mars, is debilitated. 2. The 10th lord is not in kendra. 3. The 3rd lord, Mercury is in the 8th house and retrograde. 4. Mercury is a maraka for Mesha lagna. 5. Mercury, the 2nd lord from the Moon, is placed in the 12th from it. 6. After the dashas of Sun, Moon, Mars, Rahu, Jupiter and Saturn, the dasha of Mercury will be the 7th. In the Vimshamsha, Mercury is the 12th lord, time for samadhi and sadhe saati will be on. Yogi he was and used to say, "Do bhajans. Bhajan is the medicine for all ailments and suffering". 2. My 9th lord (Jupiter) which represents the Guru is on your 5th lord (Saturn) both in Dhanu. If human life is a half-told story of stifled sobs, the company of a Yogi is the perfume in it of a flower. In this horoscope (of Yogiji) that flower is the Gajakesari yoga in the 9th house. Both Jupiter and the Moon are in blemishless condition here. There is no aspect of any planet on it nor any conjunction. The 4th lord in the 9th is the ashram and there is Jupiter here. But what is the ashram of a guru? A scholar has explained, "Aa-Samantaat Shramah" the place where all types of labour is to be done. Is there any place fulfilling such condition? Sick of the politics of the ashram he had come back to Ahmadabad. His Guru had assured him that he would appear after his samadhi (death). Such divine hope assumes the shape of life's effulgence. Perhaps this had happened in Jupiter-Mars (1966-67) which he wanted to erase from his memory. But subtle hurts are unbearable, particularly if they come from a person whom you venerate. Jupiter and Mars are 6/8 here. In the crematorium like silence of his house,in Jupiter-Rahu (1967-69) he, as though, wanted to live down that memory. Two currents flowed in his life side by side, to stop that interminable flow of his sobs and the unbroken spells of meditation which was like the flow of oil. Saturnine detachment became strong as soon as the mahadasha of Saturn started. Deep thinking in his cloistered life was very natural now because in the Vimshamsha both Saturn and the Moon are in the 9th house. As his sadhana deepened he started getting disinterested in astrology. When he did the discussion of any horoscope, he paid attention to two aspects invariably. When and how will Life-Force flow and the spiritual side. This is the essence of jyotisha which is a truth-based preaching. Were someone to ask me if I have seen anyone's blessings give fruits a hundred percent I will say, without a moment's hesitation,"Yes, my Jyotish guru's". 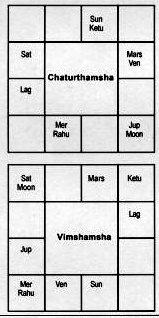 The aspect of Jupiter on his Ketu in the 5th house had given him such supernatural power that he did not need astrology anymore. Who came to him why and with concealed motive--he knew all that. I must have taken at least one hundred astrologers to him. He blessed only a young girl that jyotisha will be a divine eye for her, which came out correct. Others are the shopkeepers in a bazaar minting money like street ruffians. Last Darshan: In 1988, he once rang me up from Neetibag and said, "Will you not come to meet me? We will not meet after this." Dyed I am, in God's splendor. On 12 April 1991 singing a bhajan in his Ahmadabad ashram he fell into the immortal slumber of ultimate Samadhi.